Samantha Church had every aspect of her life going wrong; she had lost a good job, lost her daughter to her ex-husband, and was drinking more and more every day. She thought she had hit rock bottom and things could not get any worse until her ex-husband Jonathan banged on her door on Christmas morning with the worst news of her life - her sister Robin was dead. The death was ruled a drunken suicide but Samantha knew that her sister could not have committed suicide, especially not on Christmas morning as that brought back so many dreadful childhood memories. Samantha swore to get to the bottom of her sister's death, but she cannot do it alone and yet does not know whom to trust. She is up against enemies so powerful and devious, and they will stop at nothing to cover their evil deeds. 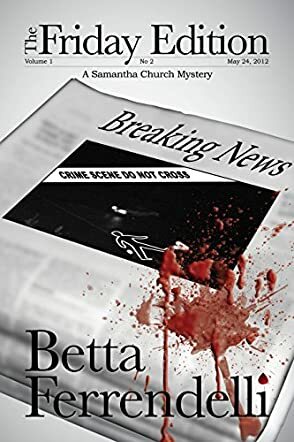 The Friday Edition: A Samantha Church Mystery by Betta Ferrendelli is a detective thriller about the corruption, deceit, and ultimate betrayal that surrounded Samantha Church's life. Betta Ferrendelli created a unique main character in the form of a brave woman who has to fight her personal demons and stay strong enough to fight the ultimate fight. She has you holding your breath, hoping that Samantha can hang in there long enough to get through the ordeal. The Friday Edition is a definite page-turner that had me reading nonstop from start to end, with fingers crossed. The story has unbelievable twists and turns and just the right dose of crime and mystery to give any fan of the detective fiction genre a thrilling reading experience. It’s Christmas Eve and everything should be great, right? But, for newspaper reporter Samantha Church not so much. Sam has a lot of problems, a failed marriage, her daughter April who blames her, and maybe worst of all, an addition to alcohol which she refuses to admit. Her addiction has already cost her a job with a major newspaper and custody of her daughter. Can things get worse? Unfortunately, yes they can. The stillness of this Christmas Eve is shattered with the death of a young district attorney, her sister. Police believe it to be a suicide, but Sam isn't buying it; her sister would never end her life that way. Sam soon discovers evidence linking her sister to a drug smuggling case and quickly learns she may have stumbled onto a major news story. Sam must summon the courage to not only face the criminals, but her own fears and shortcomings. Sam is betrayed, then beaten, but refuses to stop her investigation. When the killers threaten her daughter, Sam knows she has to turn to her ex-husband, a police detective. Can she survive, can she write the story of her career, and can she overcome her drinking problems? Or, will she and her daughter April fall victim to the savage killers…. The Friday Edition by Betta Ferrendelli is a very well written mystery. The author has taken a protagonist with a myriad of problems and a well thought out and developed plot and created a strong story that keeps the reader’s attention. The reader is drawn along as Sam attempts to deal with her personal demons and tragedies to uncover the truth. Yes, a lover of good mysteries will really enjoy this one. Very nicely done.